Payroll Mate® makes processing community college payroll easy and affordable. The software is also ideal for accounting and payroll administration students attending educational institutions and wanting to learn how to process real-world payroll scenarios utilizing a commercial payroll system. Payroll Mate® is very user friendly. Creating and printing payroll checks can be done in a matter of minutes. The process of handling payroll for a community college can often be complex and time-consuming. It is important to have a robust payroll software program in place. Payroll Mate® can help to meet many of the challenges presented by processing payroll for a community college. 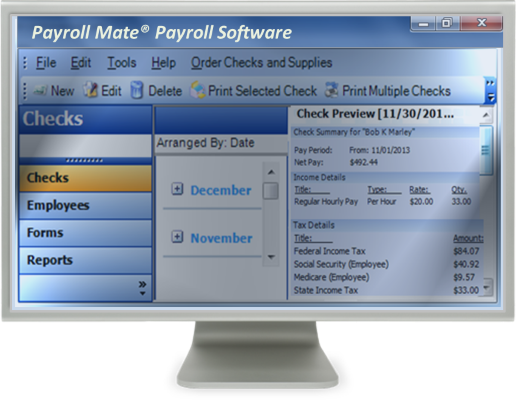 • Payroll Mate® is designed to work with Windows. You can even use this software with MAC by making use of a virtualization technology like Parallels Desktop or Oracle VirtualBox. • Your staff will find that Payroll Mate® is incredibly easy to use, but if they should have any questions, friendly customer service as available by live chat, email, and phone. • Step by step wizards and tutorials are built into the program as well. • Simply set up your employees, create payroll checks, and print signature ready checks. Pay stubs can be printed or emailed to your employees. • Payroll Mate® is designed to support a variety of different payroll frequencies and types. This can prove to be quite handy for a community college, where employees may be paid salary or hourly. Employees could also be paid daily, weekly, bi-weekly, semi-monthly or monthly. • Payroll Mate® can help to reduce the amount of time that your administrative staff must spend on calculating deductions and withholdings. State and Federal withholdings, Social Security, Medicare, and net pay are automatically calculated. • Additionally, this program is designed to handle unlimited user defined income, tax, and deduction categories. If a category is not already built into the program, you can easily custom create it. • Payroll Mate® supports Federal forms W-2, W-3, 940, 941, 943, and 944. • Simply print, sign, and send these forms. • You also gain the ability to generate a variety of different helpful reports, such as Payroll Detail, Payroll Totals, Employee List, Employee Earnings, Deposit Requirement, Tax Liability, Journal Detail, Taxes and Deductions, and more. • In the even that your payroll administrative staff should forget to back up your payroll data, it could potentially spell disaster. This is not a problem with Payroll Mate®, because your staff will be automatically reminded to back up all data. • Security is an important topic of concern today. Payroll Mate® helps you to do this by giving you a password option. With this option, you can require that staff enter a password before being able to access payroll data. This ensures that only authorized personnel will be able to access such information. • To gain even more peace of mind, you can also mask sensitive information on pay slips, such as Social Security numbers. •	While many employees still prefer traditional paper checks, and increasing number of employees have begun to request direct deposit. With an additional cost add-on feature, Payroll Mate® ensures it does not have to be difficult to set up direct deposit. •	This program can also help to make the process of administering sick and vacation leave time much easier and faster. Simply get started by choosing whether time is earned per check or by the total hours on a check. The program will then handle everything for you, including tracking how much time your employees have accrued and used. That information can even be printed on pay stubs to help employees keep track of the amount of time they have earned and used with each pay period. Overall, Payroll Mate® can provide you with an easy to use feature that makes processing payroll an easy task. Payroll Mate® ensures that you can accurately process payroll in a timely manner while still having the time to focus on your every day job duties.